True orthodontic emergencies are rare, but when they occur we are available to you. As a general rule, you should call our office when you have a painful appliance problem you can't take care of yourself. We'll be able to schedule an appointment to resolve the problem. When you get your braces on, you may feel general soreness in your mouth, and teeth may be tender to biting pressures for several days. Stick to a soft diet until your teeth do not hurt to chewing. Some patients actually find that chewing sugraless gum right after the movement is initiated (right after the braces are placed or adjusted) can actually decrease the discomfort you will feel. Irritated gums and other sore spots can be relieved by rinsing your mouth with a warm salt-water rinse. Dissolve one teaspoonful of salt in eight ounces of warm water, and rinse your mouth vigorously. Placing BraceAid on the affected area may help relieve discomfort; similary any teething gel (such as Oragel) will help with sore spots and can be found in any pharmacy. You may also take acetaminophen (Tylenol) or whatever you normally take for a headache or similar pain. Non-steroidal anti-inflammatory medications (aspirin, ibuprofen and naproxen sodium) actually can slow tooth movement if taken in excess, so it is not advisable to use them frequently while wearing braces. 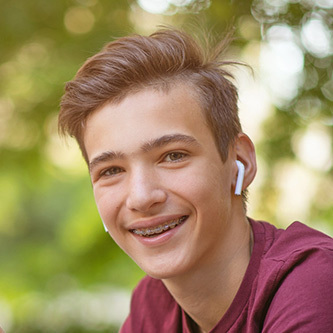 The lips, cheeks, and tongue may become irritated for one to two weeks as they learn a new posture and become accustomed to the surface of the braces. You can put wax on the braces to lessen this or use your lip bumper. We'll show you how!